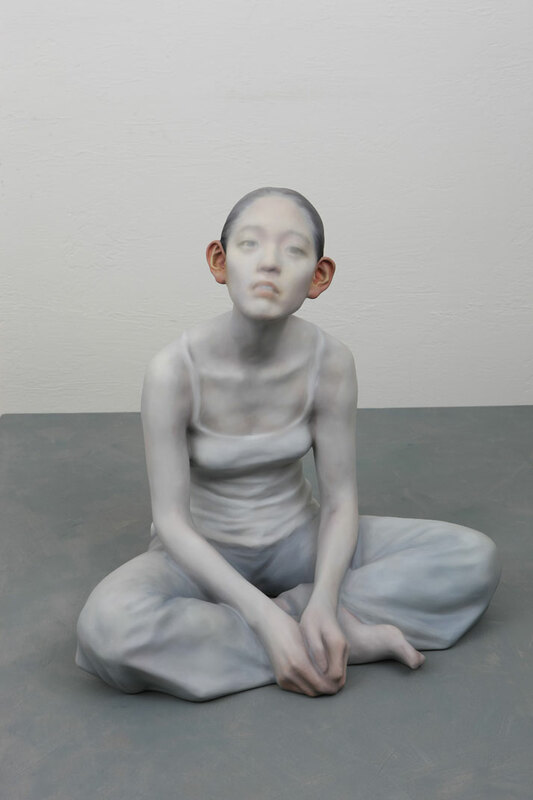 Known for his unearthly but highly intricate human figures, South Korean artist Choi Xooang has been sculpting for the last 10 years. Following his most recent exhibition, The Blind for the Blind at the Galerie Albert Benamou in Paris, Choi Xooang talked to Yatzer about his sculptures and their impact on the viewer. 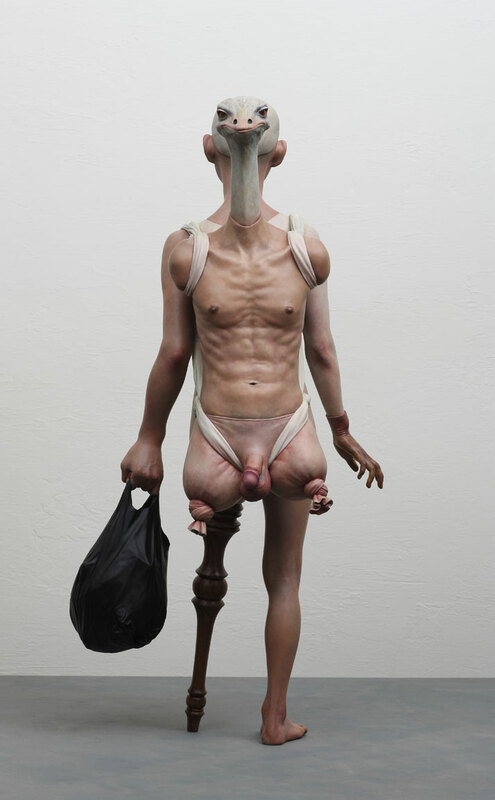 Distorted and haunting, and certainly not for the squeamish, above everything else, Choi Xooang’s work reveals his deep concern for the human condition in society – and how he feels that something needs to change. 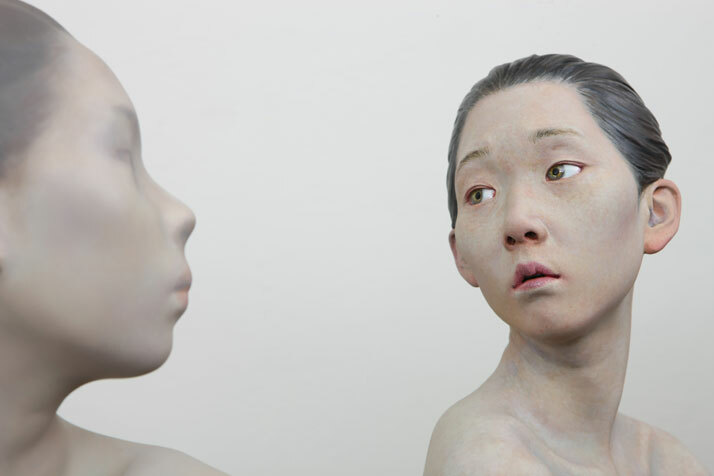 Although the viewer is both repulsed and fascinated by the gut-wrenching hyperrealist sculptures of human bodies, Xooang’s mastery of the art and eye for detail right down to the smallest vein, is remarkable and reminds of the intricate work of Ron Mueck. 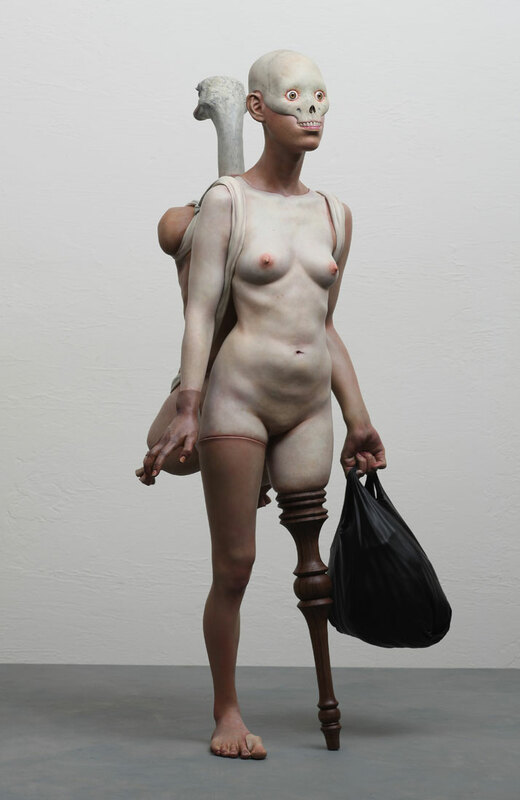 As well as being hyperrealist, Xooang’s work is also surrealist and is charged with existential questions. 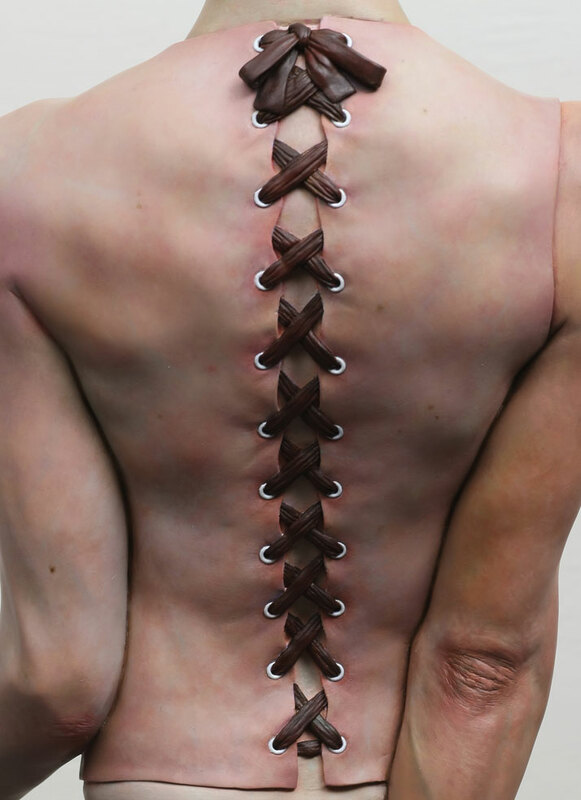 His freakish figurative sculptures are mutilated or abbreviated. 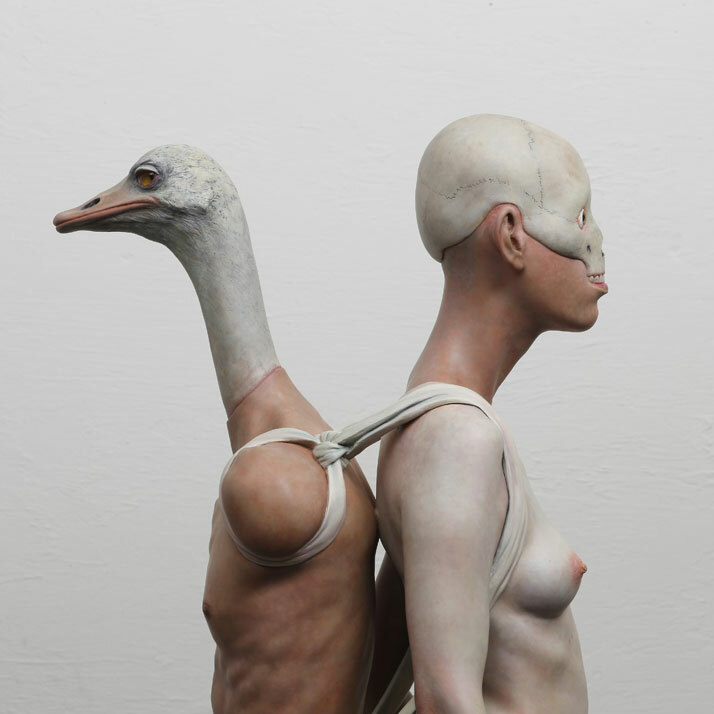 Merging unexpectedly, flesh is sewn together with ribbons, heads are plunged together to make one, a head is replaced with that of a hound or an ostrich and fists are plunged into backs of heads Ultimately, people are silenced and held captive by their condition. 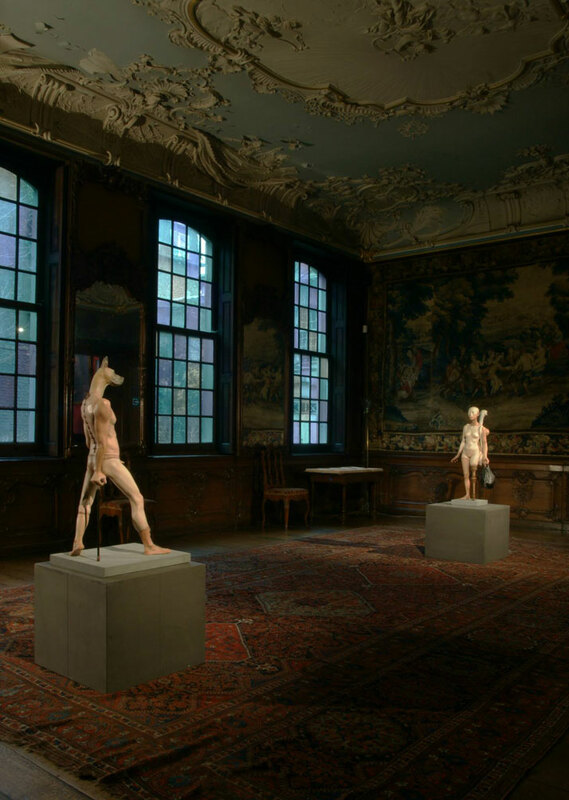 Installation view of Choi Xooang's solo show at the Musee d'Ansembourg in Liege, Belgium. 24 January-14 February 2014. Raw and cold, the works portray a bleak reality of the multiple facets of human relations and contemporary psychology. ''His sculptures that reveal mental maladies of contemporary people – lost; deficient; paranoid; and deprived of free will – and violence hidden beneath the rationality of society also explore ontological questions about human existence and identity,'' reads the exhibition catalogue. However, despite the horror displayed in his work, the artist isn’t a pessimist, ''There will be a solution,'' as he tells us. What is your background? How long have you been a working artist? I’ve been working as an artist for 10 years. The first exhibition was held in 2002. When did you begin? When did you start experimenting with sculpture? I was first introduced to sculpture as I went to an arts high school. Sculpture is particularly interesting for me because it involves tangible material, dealing with an actual object. Why did you choose sculpture? Why hyperrealism? My sculpture might be seen as hyperrealism in terms of technique, however, what I express through it, is not reality itself. I distort or exaggerate reality in order to express a certain phenomenon or status. Who and what has been your inspiration for your latest series of work? Friends, acquaintances, politics, society, and news… everything inspires me. Is there a reference to South Korean culture or politics in your work? If so, what is being said? When something looks wrong or sick in everyone’s view, it can be healed by collective efforts. There will be a solution. South Korea achieved overwhelming economic progress in a short period of time. I always try to explore the relation between individuals and society in which they live. 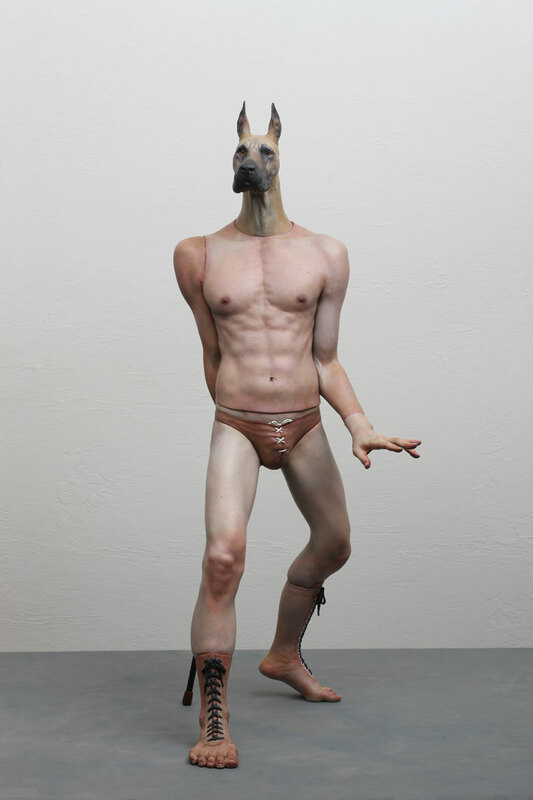 My sculptures consist of individuals displaying their own idiosyncratic traits. There are many signs of risks in our society, and I cannot help but feel that something’s strange or wrong. I’m much concerned about the condition of each individual. How personal is your work? What can the viewer learn about you from your work? I don’t think my work should deliver certain messages nor educate an audience. What is more important is to raise questions, and to sympathise and communicate with others as one of them by living in today’s society. 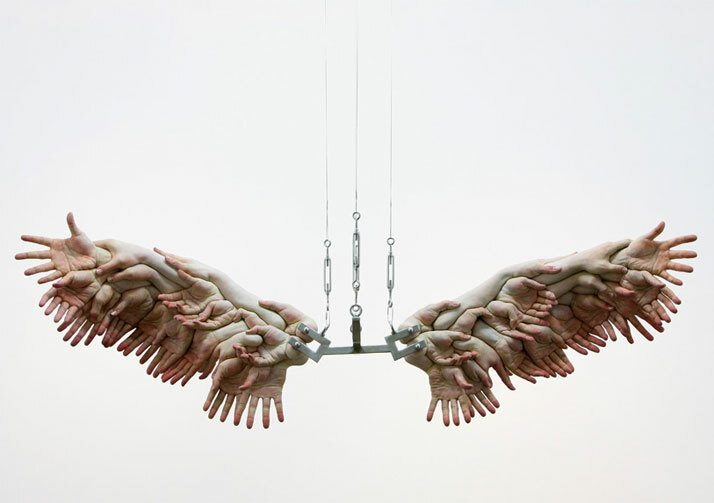 Your sculptures have a haunting impact on viewers and your work makes people uncomfortable - is this your aim? If one feels uncomfortable physically or mentally when viewing my work, I would say it worked. What do you want viewers to feel when they see your work? I am interested in social minorities. We can’t classify all individuals within the category of a majority or a minority. I want to focus on individuals and their relationships to society. Physical distortions or exaggerations are rendered with the most delicate, realistic way, expressing psychological anxiety and fragility. I hope the reality of this emotional status can be manifested in these imperfect or deformed bodies. In naked bodies, I tried to express the anxiety of the human being. Removed of (unnecessary) embellishment- clothes, style, and trends- these figures stand as individuals. While arranging and supplementing my previous work, I continue to explore new subjects and problems which will be reflected in my upcoming exhibitions.